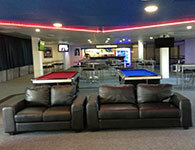 A combination of products used in 2 areas, We supplied Lounges, Club Stools and both Round and Rectangle Dry Bars. 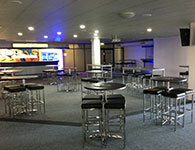 110 Club stainless steel framed stools with Chocolate PVC upholstered seats with Fresco Stainless Steel Dry Bars and 800 x 800 Travertine Table Tops. Dry bars are 304 Grade fully welded 1800 x 800 x 1050 high dry bars with Wenge Compact laminate tops with Groove insert tops for water run off. 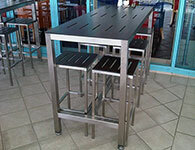 Stools are our standard Club 304 Stainless with matching Compact tops the Dry Bars. 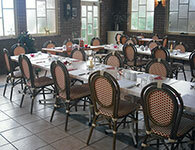 Seating Plus recently supplied the Ainsleigh Tea Gardens in Burnie Tasmania with new French (model A) side and arm chairs. Colour selected was Red and Cream to compliment the existing Décor. Table top colour used is Travertine. The base is a fully welded Oval fin style.